An exciting new exhibition will open on Friday 19 May at the British Motor Museum entitled "British Motoring Treasures: the British Motor Car in Fifty Objects". The exhibition, which will run until March 2018, will showcase the depth and variety of the nationally-designated collections held at the British Motor Museum. Funded by Arts Council England, the exhibition will tell the story of Britain's motor industry using fifty key objects. In turn each object will have its own story, whether it is of a ground-breaking invention or a piece of social history. The exhibition will celebrate the rich history of an industry that has dominated the economic and social history of the West Midlands region for more than a century. British Motoring Treasures will encapsulate the word 'object' in the broadest sense and include archive material, artwork, publicity material, signs and tools. One example on display will be an original sketch from 1944 by Alec Issigonis of the 'Mosquito', a car that would be the prototype for the Morris Minor. The Trust archive is home to a large collection of items relating to the life and work of Issigonis who designed many famous cars including the 'Mini', but this is the first time an original sketch has been on show. Some his drawing tools and a slide rule will also be featured in the exhibition. 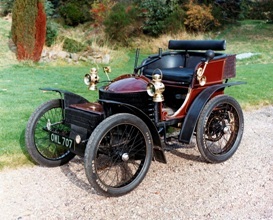 There will be three cars on display - a 1899 Wolseley Voiturette, the first 4-wheel car that Herbert Austin designed and a 1965 sectioned Austin Mini which was a revolution in motoring terms and a triumph in automotive packaging. The third car will be revealed when the exhibition opens. The displays will also feature lesser known aspects of the story, especially the role of the people who designed, built and used the products of the British motor industry. One example will be a selection of recipe cards for meals served in the 25 staff canteens at Longbridge in Birmingham. The cards were colour coded and mixed together in different combinations to ensure a balanced and nutritious menu was produced each day. Also on display will be a publicity booklet from 1910 issued by the Shell Company that throws new light on the ill-fated Antarctic expedition led by Captain Scott. Ultimately the motorised sleds built by Wolseley used on the expedition proved mechanically unreliable and unsuitable for the severe conditions experienced at the South Pole. Running alongside the display, a 'People's 50' will be assembled, providing community groups with the opportunity to loan, nominate or suggest significant objects of their own. This ongoing project will be undertaken by the Trust's Community Engagement Officer and material loaned will be displayed in the Museum during the exhibition. Entry to the British Motoring Treasures exhibition is included in Museum entry. To find out more about the Museum please visit the website at http://www.britishmotormuseum.co.uk where you can also buy tickets online, alternatively call 01926 641188 for more information.